Yes Reggae and World music fans it is that time of year again, the festival season is upon us and almost one month away the first major festival in Northern California will set it off. The Sierra Nevada World Music Festival is taking place at the Mendocino County Fairgrounds in the scenic Anderson Valley town of Boonville on June 19, 20, 21. This festival has long been favorite start to the summer festival circuit since its beginnings years ago in Marysville, CA. Now with it’s new home in the Coast Range mountains (far from the Sierras), this will be the fourth year at the Boonville location. Then the festival moved to Angels Camp. 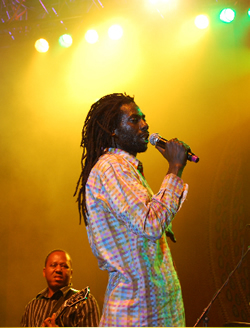 Seeing Midnite perform there was like witnessing a dawn in the roots movement. This was a great location except for the city of Angels Camp police dept. that felt the need to constantly harass festival patrons for blazing up the sacrament. Too bad for Angles Camp, its their loss. The Boonville location is a perfect place for an outdoor festival. Good weather, nice vibes/friendly people, and a more country atmosphere really provide an all around weekend escape for many coming from the cities and suburbs. There are always such a great crew of organizers and volunteers that help to make this a great festi. Last year there were some unfortunate circumstances, the raging forest fires that filled the valley with smoke, and some crazy guy altered on some synthetic chemicals. Please folks leave that sh**t behind. To really overstand this music you need to be able the receive insight and clarity. Leave the drugs behind, blaze up some of Mendocino County’s finest high grade and hold a meds seen? This year we have some great performers headlining the event that will make you glad you came out. This will be Tarus Riley’s first Northern California appearance, along with Etana. These are two of Jamaica’s brightest stars today. Bushman, Anthony B, Cherine Anderson, Michael Rose, The Itals, Gregory Isaacs, Ras Michael, Sly and Robbie, The Heptones, Michigan and Smiley, and The Abyssinians will all be representing Jamaica and bring the roots to Mendo. Coming from Nigeria, Femi Kuti, son of Fela Kuti, will be a performance not to miss, check this brother out for sure! Next in World Music line up is King Sunny Ade, another Nigerian performer will a very loyal following. Originally hailing from Congo, is Zap Mama headed by female vocalist Marie Daulne, this band has worked with the likes of Michael Franti, Erykah Badu, Beres Hammond, Talib Kweli, and many more. Also appearing from the Hawaiian island of Maui is Reggae Singer Marty Dread who is sure to nice up the place with his signature “Jawaiian” style reggae. Blue King Brown coming all the way from Australia should be a perfect fit for Sierra Nevada World Music Festival with their Urban Style Roots. Many more bands are listed so be sure to check the website www.snmwf.com for the latest updates. Big Up Radio will be there again to celebrate this family reunion that takes place around the Summer Solstice each year. Large Up and respect to the promoters, press coordinators, security, and all the volunteers that make this SNWMF possible. Let Ã¢â‚¬Ëœem know you appreciate the hard work they do to provide us all with a quality experience. Camping and parking is limited, so please carpool, and plan to get there early for a good camping spot. No Dogs, drugs, weapons allowed. Bring your good vibes, your friends and family, a big head spliff (or two) and come celebrate this Nor Cal reggae tradition with us. There is a real community spirit here, so be good neighbors, look out for one another, and be respectful of others.